Spaceport helps you build beautiful high-performance games and run them as native apps. 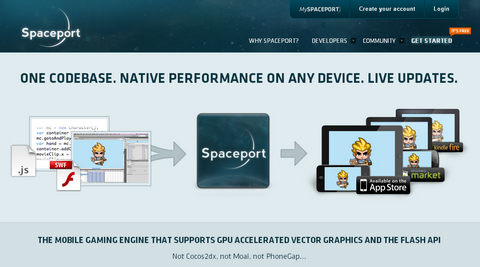 Spaceport uses OpenGL to accelerate rendering on native devices. With Spaceport’s graphics engine, you use versatile and efficient vector graphics formats instead of bloated sprite sheets. Doing so minimizes the size of asset downloads and drastically reduces loading times. It looks interesting, but 10% of app-store net (after $1000) is kind of a gamble, unless you’re not planning to be successful – since that puts your total % out to almost 40%. Great resource for teaching, probably.